Several lace items were implemented, as well as the specialty tools used to make lace: set of wooden bobbins/set of ivory bobbins and set of steel pins. The items are: cotton lace dress, lace-decorated silk dress, cotton lace top, long-sleeved lace shirt, silk lace bra, silk lace knickers, silk lace gown, cotton lace tights, silk lace stockings, cotton lace veil, silk lace veil, silk lace gloves and cotton lace gloves. Thanks to SekoETC for making these additions, and to *Wiro for helping out. All these items should have their related wiki pages added too, if they don't or if you see something wrong feel free to sign up for a wiki account and do the corrections yourself, or let someone in staff know. We have some additions for interior design. It's now possible to build wool, hemp, silk and cotton curtains. You can also build wooden and paper blinds. All of these can be manufactured in buildings and vehicles. Moreover, to make transporting many light objects or multiple raw materials you can build a portable shipping crate (check it in Cantr wiki. These two were done mostly by *Wiro. Some more objects are now able to be diassembled, mostly tools and weapons but also a few semi-finished products. I hope you still remember the announcement from the end of the year, where I mentioned the introduction of horseback riding. There was still much work to do then and we were working to finalize some details. Now I can say the work is almost complete, so you will be able to have it quite soon (in a few days). In the mean time I'll give you a preview of a new feature so you can be prepared for that. 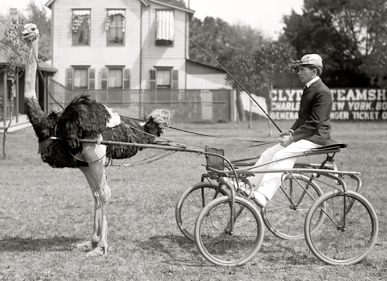 To start off I'll warn you: steeds can be useful, but only if the decision to tame one is really well-thought. Steeds require feed to be maintained, so make sure you are prepared for that, as the consequences of misunderstanding the system will not be refunded in any way. The first thing to do after finding a horse (or a donkey, zebra, kiang, camel or ostrich) is to tame it. It's almost the same as for other animals, but it requires a special tool - a lasso. If you are successful and get a domesticated horse, then you have to adopt it, just like any other animal. Once an animal is loyal to you, you can start saddling it. You need a saddle and some time. It takes a few days. 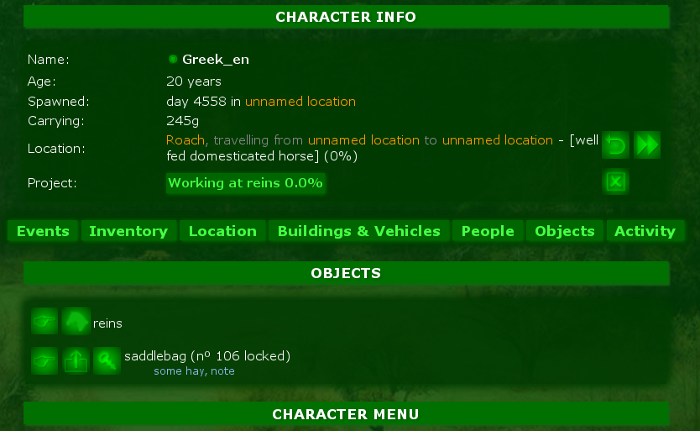 Its default dynamic name shows the animal's owner, but you can remember the animal as anything you'd like. As horses have no locks, there needs to be a different way to restrict control over them. That's why only the owner can start riding, change its speed or make it turn around. The owner can also drag things from the horse much easier and the owner is much harder to drag away from it. Then there's the equipment: the most basic thing is a saddlebag. As anybody can get on a horse, the saddlebag is the easiest way to keep your property safe. A saddlebag is a single large lockable storage for your things, from which the animal will also eat when there's no feed outside. Another interesting thing are reins. They are a kind of special 'machinery' that allow you to control the horse by actively working on a project and make it move reasonably faster. When you are not as interested in having top speed, but you'd like to carry more cargo, then you can build a cart (for big steeds) or a small cart (for small ones). It's a bit similar to a sidecar for motorcycles. Be cautious, as having a cart decreases the animal's speed (even if it's empty). The lasso I mentioned is used to tame and adopt the animal, while the saddle is used to saddle the steed. There are also two smaller improvements: to make feed easier to get we've introduced a wooden dung-fork. In addition, time to lay or disassemble a haystack is now halved to encourage mobile hay production. When you are the owner of a steed unsaddling it is similar to disassembling vehicles: you just have to completely empty it. This makes horses relatively easy to transport: after removing the saddlebag and unsaddling it, you can drag it onto a ship and take it to a different island. Such an animal usually* retains its custom name when saddled again, so you won't have to name it the second time. But why use horses? Could they be better than tandems or cars? The answer is: yes, in some cases. 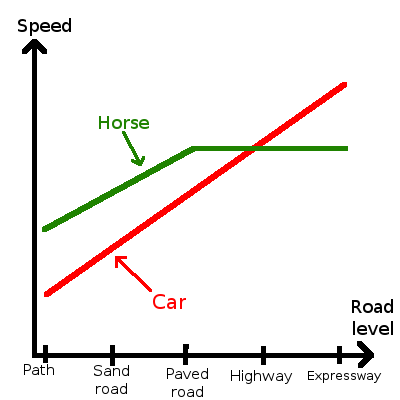 Firstly, horses are better than cars when riding through underdeveloped areas. When you ride on a path you move much faster than you would with a car. That advantage becomes smaller as the road level increases. A car becomes a comparable (or a better) choice on a paved road. Secondly, they are good when your character travels a lot, because they need to be fed every day. On the other hand, they do require hay or vegetables, which are usually easier to get than petrol or other fuels. I hope you are as interested as I am. Stay tuned! The horseback riding is now available. To start saddling an animal, you have to adopt it first, otherwise the special button won't even be visible. I've also noticed I forgot to mention zebras in the last announcement. So, the full list of animals that can be used for riding are: horses, zebras, camels, ostriches, donkeys, white donkeys and kiangs. The wiki is not yet updated, but it's going to be done in the following days. Please report any unexpected behavior using the support form (because something's wrong with emails sent directly to programming). I'd also like to say thanks to the members of Resources Department whose help has made the project possible to be completed. Not very long ago on Twitter I mentioned that books are in progress. In fact, it was almost finished then, and now it's time for an official presentation. The part handled by the Resources Department is not yet ready, but we'll do our best to make that phase of development as quick as possible. First of all, what is the reason to have books? To answer this, it's necessary to consider what the main problems are regarding publishing and sharing notes using envelopes. You can't show the contents of an envelope without risking somebody quietly taking/editing one of the notes inside. You have to check if everything's alright every time somebody gives you an envelope back. Another trouble is organizing them - when multiple notes represent consecutive parts of the same text, then it's hard to have them go one after another, especially after copying them. In addition, the special ability to change the order of objects has also been enabled for envelopes and bookcases. It's most likely the first new thing you'll notice right after reading this announcement. Please note that bookcases work well with books - it's still possible to read a book when it's in a locked bookcase. 1. Manufacture a book - there will be a few options available. The book is a note storage like an envelope, so in your inventory it's in the "Notes" category. 2. Put notes inside. Use the same button as for storing into an envelope. 3. Look in the book, click "reordering" and change the position of notes using drag and drop. Then confirm so that your changes are saved. 4. Bind a book (a special button). Select the book title and confirm. Then it's impossible to put more notes inside, take, edit or reorder them. 5. Click the "copy" button to start copying the book project. It creates a book with the same type of binding as the original book. 6. Click the X button to start disassembling a book. It results in destroying the book and getting the notes back. Books don't provide any built-in visual template to make notes look like a book. That's something that can already be done well with CSS. This feature is to facilitate the use of large note storages and the management of libraries. As I’ve already said, it’s only the final programming work to enable books to be made. They are currently still awaiting decisions from the Resources Department regarding the different possibilities for binding, and we would like to get more input from players. If you have suggestions, please add to the discussion at http://forum.cantr.org/viewtopic.php?f=35&t=5648&start=75. After the option is enabled, then it will send reports which are exactly 3 days old - not too early, to give you time to name all the recently met men in their twenties, but also giving enough time to request them manually in case there is a problem with an automatic script. But what are daily reports in the first place? A report is an email which contains event logs of all your characters in a single day, something that can make it easier to keep track of your characters' history and memories. Please note reports older than 4803 won't be sent automatically. Wood plates now take 1 day because 3 days was excessive (bookcase: 2 days, barrel: 3 days) and the new tableware uses similarly short times. It used to be important because wood is "cheap" but with custom descriptions everything can be "expensive". We'll soon make all glass items use refining skill, so expect that to happen in the next week. Any projects you set up -now- will still use the old skill (or no skill) even if finished later, so you can plan ahead if you wish. Foul-smelling soap was finally changed to lard soap. In addition, soap will no longer decay over time. Instead, it will use a decay-per-use system where each use makes it decay a little more. We're hoping that this will mean more people will use soap now and hopefully you will let us know if it changed things for you in-game. Shop owners everywhere rejoice. Also, wheeled display case. Bookcases can be disassembled. Carvings and figurines are visible from inventory. Several new items can be labelled. Also, paper bags are new. It's also worth noting that mounting/unmounting animals bacame a special event. Some people didn't like "You see XYZ enter domesticated kiang", so it was changed to "You see XYZ mount domesticated kiang". It's our intention that most of these lights will have a project similar to the "cosy fire" in the fireplace, where you can enter candles, coal, oil or other fuel types to keep the light lit. This may take some time, so consider this phase A. Maybe you've noticed that title of each page starts with the name of your character. In addition, when you leave inactive tab open on the events page, then title contains a number indicating how many events have happened since you seen it last time. Please report if it doesn't work on your device. 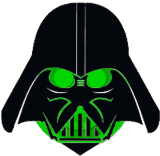 The most visible change is a different forum style, which is green and responsive. There are two other styles (themes) available in your account settings: basic (also green) and prosilver (phpbb's default blue). This update means it's no longer necessary for new forum accounts to be confirmed by administrator (me, specifically speaking). It's just necessary to use the same email address as for Cantr. So I'm happy. Please report any issues with forum using Cantr support contact form. I've introduced the mechanics so long ago that I had to spend quite a lot time recalling how to correctly create concrete book types, but now it works correctly and is ready to become available for everyone. To say it again, the goal of books is to give a secure way of lending sets of notes and organizing notes in locked bookcases. Books are very similar to envelopes, so after you build one, you need to use envelope icon ("put this note into envelope") instead of storing in a storage. It also means you can use operations on multiple notes to facilitate the process. 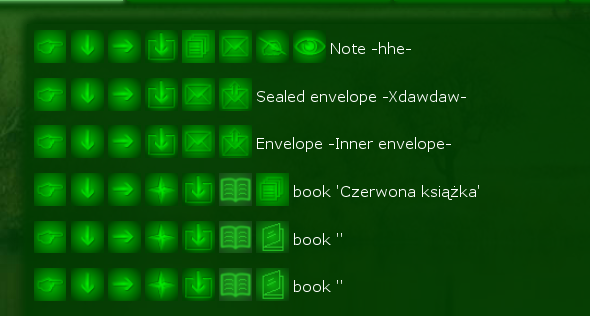 After you put notes inside, set the correct order and decide about the title, then you can permanently bind the book. It means the title becomes unalterable, all the notes inside become uneditable and impossible to take, but they still can be read or copied. It also becomes possible to copy the whole book, including the notes inside. Books can be described using a bodkin, but book description needn't mention the title, as title is already visible. To reclaim the notes from a book you can disassemble it using an axe. The whole system is quite complex, so please be careful when playing around it. Forum is a good place for any questions regarding the system. Some other details are accessible in an old announcement a few posts above. To maintain the quality of the game play and of the organisation of Cantr, we are making some personnel changes to the Game Administration Board. We welcome new members Joshuamonkey as chair of the Public Relations department and Theda as chair of the Administrative Support department, while Theda will continue to function as the main personnel officer. Both are longtime players who are experienced members of the Cantr voluntary staff. We wish to take this opportunity to thank Kendo and Faith for their excellent work for the many years as chairs of public relations and administrative support, respectively, and hope that they will continue to actively contribute to the Cantr community - and we wish the new chairs all the best in their new roles! There's a new subforum: Staff Concerns. A new forum is quite a rare change. Note that this forum is for any language, not just English. Welcome to the Staff Concerns forum! This forum is to express concerns (or complaints) about Cantr staff and to give suggestions to staff, while also providing a place for staff to inform players of how the staff functions and to address concerns. We ask that everyone (both staff and other players) express their views in an objective and constructive manner. It isn't our desire for this to turn into a forum of insults and bad language. In other words, what can be done to improve the Cantr game and community? For that it is also important that complaints are about staff in general, not specific staff members. If you have complaints about specific staff members, contact the GAB in private message or other direct communication with GAB members. Of course, generally details of specific PD cases cannot be mentioned. When in doubt, leave it out but send a direct message to explain what you're referring to. And of course, the 4-day rule for in-game information applies. The staff are volunteers, busy with life, and we hope that you can provide valuable insight to help us maintain Cantr. We are always willing to learn! As always, we also encourage you to apply to Cantr staff.